What do expect to find in the gardens of an 18th century mansion house that was once crowned the Historic Houses Association/Christies Garden of the Year? Something pretty thrilling, that’s what. 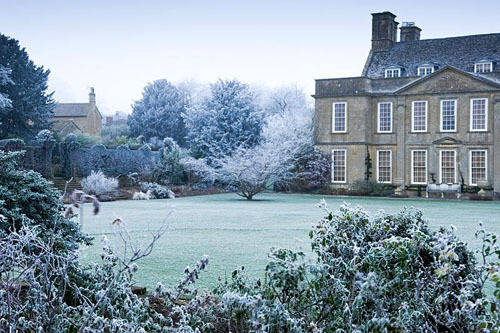 Fortunately, Bourton House in Gloucestershire does not disappoint. Close to the picturesque village of Moreton-in-Marsh, the honey coloured Queen Anne style house sits within a three-acre landscaped garden that occupies an enviable position with sweeping views over the gently rolling Cotswold hills. Within its boundaries are beautiful borders, pristine lawns, water features and one of the best collections of topiary in the country, where every piece is kept in pristine condition. Despite turning heads today, the garden was in a poor state when Richard and Monique Paice arrived at Bourton House in 1984. Back then the grounds had been neglected for some time and were largely overgrown. Over the next 25 years, the Paices’ dedicated much of their time to transforming the garden they had inherited and were ably assisted by Paul Nicholls, a former gardener with the National Trust, who joined them in 1999. Although the Paices sold the property in 2010, the new owners retained Paul as head gardener, along with his deputy Jacky Rae. The continuity has obviously paid dividends as the garden continues to attract thousands of garden lovers looking for ideas and was recently received a silver award as best small visitor attraction of the year from Cotswold Tourism. 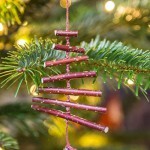 The garden is divided into a series of connecting rooms with imaginative layouts, exquisite planting and clever touches that make it a joy all year round. 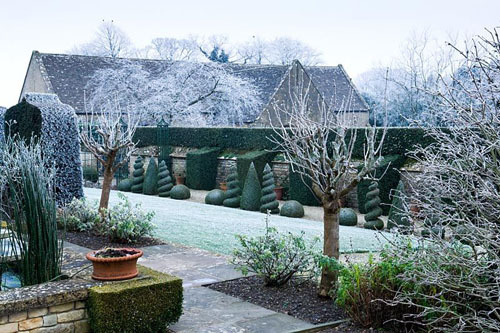 Even in the depths of winter there is plenty of interest thanks to former owner, Monique Paice’s weakness for ornaments, architectural plants, topiary and clipped specimens. A parterre close to the house is kept in immaculate condition. The curvaceous design made from box sits amongst gravel and is punctuated by perfect topiary spirals that resemble the swirling shape of freshly served soft ice cream. 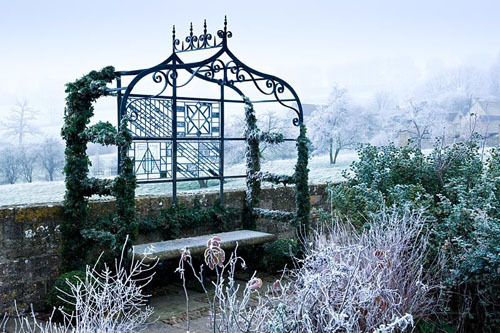 Elsewhere, there’s a knot garden that takes on a magical appearance when dusted by frost on a chilly winter’s morning. ‘Mrs Paice really loved the structure and formality the knot garden provided,’ says Paul, explaining that this feature replaced a rose garden that had occupied the same position. Unfortunately, her ‘Iceberg’ roses were struggling, so she dug them all up and put together a plan for this formal feature that is undoubtedly one of Bourton’s highlights. 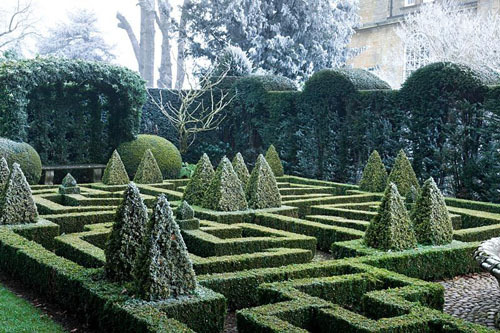 Made from over 3000 box plants, the intricate network of low hedging and pyramidal shapes sits behind a curtain of yew hedging. At the heart of knot garden is an unusual pond made from an ornate stone basket that was originally an exhibit inside the Crystal Palace erected in Hyde Park for the Great Exhibition of 1851. A border flanks one side of the feature and provides interest during the colder months of the year thanks to grasses and architectural plants that look delightful when touched by frost. 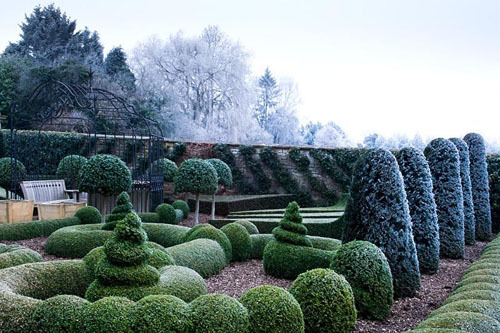 There are many metres of hedging that need to be kept in trim and numerous pieces of topiary to clip. It’s a time consuming job that takes many weeks to complete when the plans are given their annual prune, between July and September. The results are clearly worth it as the crisp outline is much admired by visitors, who drawn back year after year. 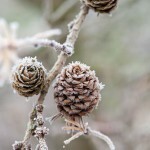 This entry was posted in My favourite, Seasonal, Winter on December 29, 2014 by gapadmin. 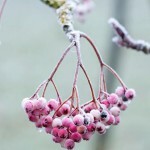 Some gardeners fear a cold snap for the effect it might have on tender plants, but there’s no doubt that when the mercury plunges that it can produce some magical results. 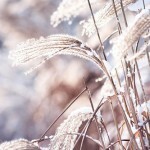 Frost usually occurs on clear, still nights, when the temperature on the ground or in the air falls below freezing point. 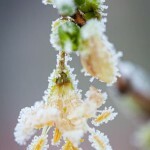 A light frost leaves plants looking like they’ve been sprinkled with icing sugar but the impact of a harder, hoar frost are much more dramatic – plants are covered with crystals of ice that are often so thick they can be mistaken for snow. 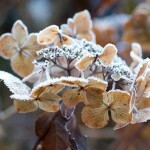 Walking around the garden on a frosty day can be a wonderful experience. 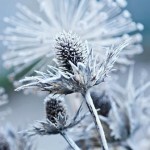 The plumes of grasses, shrubs and the remaining flower stems of perennials, such as echinops, cone flowers and eryngium stand in stark relief under a crisp coating of icy needles. Their beauty can be appreciated at distance, while other plants need to be viewed from closer proximity. 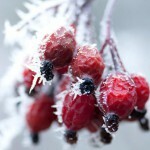 Rose hips, holly berries and the fruit of many other plants have the appearance of hand-made sugary comfits, glistening temptingly under a deposit of ice crystals. 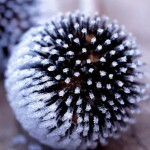 Frost is not selective and even the most utilitarian plants, such as vegetables, can be turned into things of beauty by its icy touch. 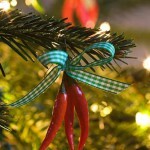 This entry was posted in Seasonal, Winter on December 23, 2014 by gapadmin. 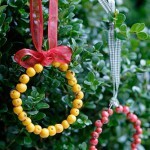 Winter might not be the most productive season, but there’s plenty of material in the garden to make festive decorations for brightening up both your indoor and outdoor space. 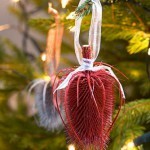 Collect sprigs of evergreen foliage, colourful stems, berries, fruit, pine cones, seed heads and attractive of slivers bark and combine with ribbons, baubles and beads to embellish Christmas trees, windows or plants in the garden. 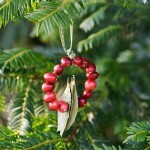 Natural decorations are far easier on the eye than artificial ones made from glass, or worst of all, plastic. 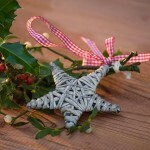 There are endless possibilities to what you can create, and you can make decorations as elaborate or simple as you like. 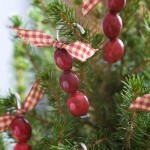 For example, if you’re feeling dextrous try threading beads onto ribbon, then secure to a pine cone to make a pendent for an indoor tree; for something easier, take three chilli peppers and tie the tops with ribbon. 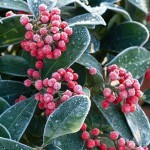 Make the most of pyracantha berries, crab apples, cranberries and other types of garden fruit. 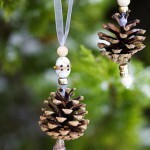 They are easily threaded onto lengths of wire and are fairly long lasting, especially if you display them outdoors, where cooler temperatures will help to preserve them. 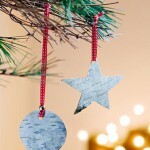 Whether you copy some of ideas here or have a go at inventing your own, make enough decorations so they provide the intended wow factor. This entry was posted in Christmas, Seasonal, Style notebook on December 18, 2014 by gapadmin.